power and punch — without squashing. 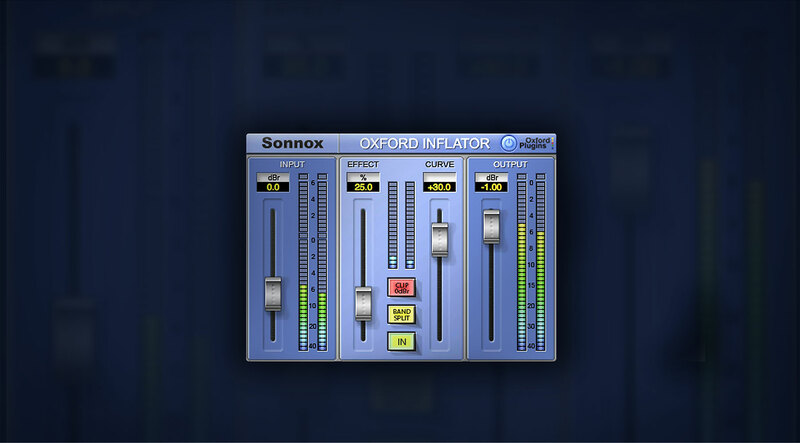 A longtime secret weapon for audio professionals, the Sonnox Oxford Inflator does what so many dynamics processors only pretend to do — increase the apparent loudness of your mix or individual tracks, without audibly affecting sonic quality or reducing dynamic range. The Inflator can add power, warmth, and presence to your mix, providing virtual headroom above digital maximum, while maintaining musical character. The proven answer to today’s heavily compressed, "louder-is-better" mixes, the Inflator can deliver louder mixes without the pumping and over-saturation commonly associated with compressors. So you can add loudness to even heavily squashed or compressed material, or add musicality and apparent dynamic range to previously clipped signals. This little plugin is amazing at bringing your mix to life! i use it all the time. I'd always used this plugin(native version) for each track, but it was heavy. I re-bought this plugin on UAD for PC's CPU load, and it's so good. I'm not sure what this plug in does. I tried it out to help control loudness of a digital drum mix, and was sold after the first try. The average power level of the tracked signal can appear to remain low, yet the perceived loudness of mix is very in your face and, in fact can sound like it is over clipping levels A quick glance at the meter shows that isnt so. Nonetheless, unattentive use of this plug in can result in distortion and clipping, and I find this very harsh. I prefer using it as a loudness or boost; I ;m still experiementing where in the chain to use this, though it appears to best be used at the latest stages of mix. I'd always used this plugin(native version) for each track, but it was heavy. I re-bought this plugin on UAD for PC's CPU load, and it's so good. This is one of those 'does one thing and does it well' plug ins that comes in really handy. I've used it on a few final mixes now and the clients have all smiled so far when they get the on / off demonstration. Not one single person has as yet said... no thanks. I haven't read the manual yet, so I probably should so I can get the most out of it, but I think it's another great UAD-2 tool that I'll use daily. I see so many negative reviews here from cheapskates moaning about the cost of these plugs but c'mon guys, we're saving freaking thousands of dollars using these great plug ins instead of having to buy the hardware units that don't sound any different generally. This tech is just plain brilliant, especially when used with an Apollo. This is a nice tool to enhance the volume of your recordings. I keep it simple to preserve the dynamic range of the recording. At extreme setting it will add distortion to the whole mix, which is not for me, so I mainly work with the INPUT and OUTPUT sliders. Is that simple. This plugin is one of the most useful and pleasing processors I have encountered. It's easy to use and versatile. I use it on individual tracks, groups and anywhere else I need to make the most out of a sound without destroying it's dynamics. I'm very happy with this purchase as I knew I would be. Thanks, Sonnox and UAD. This is a good plug. The Inflator is another path to Maximizing. Since uses a different algorithm than the P. Max, is sounds different - more 'Metal' than 'Jazz', more modern, more surgical, slightly less 'tubey'. It is easier to get too heavy-handed with the Inflator, but it is a good alternative to the P. Max for Mastering. I also found less use for the Inflator on mix busses and individual instruments than the P. Max. As a mastering engineer, it is a great alternative to the P. Max and other 'maximizers', harmonic enhancers and 'Exciters'. It definitely has a mature sound - no shoddy programming here. Demo it and decide. And experiement! It has a wide range of sounds for so few controls. The Sonnox Inflator is another way to make mixes louder without squashing them. It doesn't work on everything; if a mix already has a lot of saturation and harmonic enhancement, the Inflator can make these elements harsh and unpleasant, but when a relatively clean mix needs that extra upfront sound (in your face), the Inflator makes a nice alternative to the P. Max. Try both; invariably one works better for a given mix. It is not always clear which one and sometimes neither is appropriate. Make no mistake, the Inflator has a different sound than the Maximizer - less 'tubey' and more surgical and aggressive (at higher curve settings). A good tool for mastering engineers. The UA Sonnox Oxford Inflator is proving to be such a great tool for us. Great sounding loudness with no compromises. It's like HGH for your mixes. We're using it a lot! I activated the demo if this plugin soon after it was released and tried on lot of different materials I had edited/mastered before. I pretty much decided to get it right after testing it on two of my songs - its pretty amazing how this little thing works. Further tried it on some of my acoustic guitar tracks and that alone would have justified getting this plugin! Really nice results. Sounds are maximised while not crushed and in individual tracks it does wonders on bringing selected tracks live. I own pretty much every plugin from UA but purchase decision had never been easier than for this one. The simplicity of this plugin is its strength because you can try it quickly on a track - it will either make the magic or it won't - and you can either apply it, or go on with your search. In my application, which usually includes voiceover, it seems that the Inflator is least desirable if there's already a fair amount of compression on the track. It may be most impressive on sparse and raw sources. I own and love some of the UAD plug ins, and some of them don't get used. This is one that doesn't get used. This plug in does what it says it does, it inflates, and the demo's sound pretty good, but I don't think it's right for what I do - which is drum machine, synth, vocals type stuff. It's probably better suited for some other use/ not for everyone. ??????? ??????? ????????? ?? ????????????? ??????! ?? ????? ? ?????? ?????????!!! No sense in this plugin. He is not bad and not good - it is useless for the UAD platform. Was A Great Final Tweak For My Drums!!! Love the Sonnox Oxford Inflator plugin. I was struggling to get that final juice in a mix for snare and kick without losing imaging... I tried this one and WOW!!! It just has the "something extra" I was looking for, Really picked them up with a detailed edge. I got a defined placement in the mix with a not-too-distracting loudness. Love it. Don't know why it took me so long to use this thing? Very simple and highly effective plug in by UA. Always wondered how can I get my mixes as loud as the pros with out clipping then I found this gem. This software has the ability to bring out the musical information of the second and third plans that are hidden. With this you make the audio more dense and rich. Be careful not to exceed it and flatten the dynamics, especially noticeable when listening at higher volumes. Inflator is being used on every sessions here !